SHELTER is a non-profit artists-run space initiated in 2017 by artists Mert Yavaşca & Şerife Aslan for the purpose of set up short-term exhibitions, workshops and art events for artists who are willing to produce, display and discuss their artworks. All eyes are on the Turkish lira. So far in 2018, the Turkish lira depreciated close to 40% against the U.S. dollar. Inflation has topped 16%. 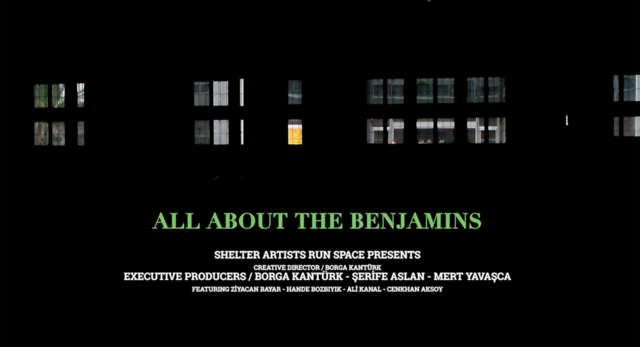 In our video project called ‘All About The Benjamins’, we discuss economic situation in art and culture production.We analyzed how the economic crisis in Turkey had an impact on artists and culture managers, economic difficulties and reflex of overcoming these difficulties and transformation in art production. While we are questioning how did the economic conditions in Turkey affect art and culture, we consult with individual artists, organisations, culture managers and initiatives to record their experiences, comments & expectations.